By Terry, just continues to bring out products that are of the highest quality. Their innovative formula’s produce such amazing textures and are good for your skin . 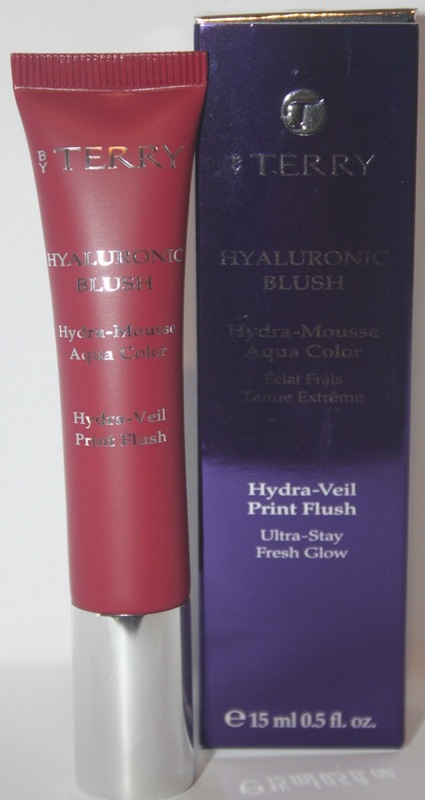 For Summer 2013 they have released, as part of the Hyaluronic range, a “hydra-veil print blush”. This intrigued me as soon as I saw it available for pre-order on the Space NK site. I chose the shade Blushberry, which is the darker of the two shades. Peach Posh, is a apricot shade, which looks lovely too. It comes in a smaller tube than the foundation. Blushberry is a pink berry with a fine shimmer, that just reads as a glow on the skin. This shimmer does not settle into any fine lines. This mousse-like formula, comes out the tube highly pigmented, but once applied sheers out. The shade can be built up without any cakiness, that you could experience with powder blush. With this particular colour, if you are prone to redness make sure that it is covered as this shade will accentuate the redness. I am wearing this over my Armani Luminous Silk today, and it is seamless with my skin. This takes “natural’ to a whole new level. I buffed it in with my Real Techniques Expert Face Brush Brush ,and it looks fresh and pretty. It does say apply with fingertips, which works well too. This would be comparable to Daniel Sandler’s Watercolour blush in finish , but the By Terry might even surpass this popular liquid blush, in my opinion. The high-tech formula of course contains Hyaluronic acid, which helps plumps the skin. I have not used this long enough to confirm this claim, but hyaluronic acid can only benefit your skin. If you remember from last summer By Terry brought out the Aqua Lip Jelly Tint (reviewed here). Both these products works on the same ‘aqua-print pigments’. This is good for the summer months as the products holds up well to the heat. This product is so nice I will use it all year round. The finish is matte and non-sticky. and my oily skin loves it (but of course with the Hyaloronic acid component dry skins will love it too). Hopefully if these two shades sell well, By Terry will bring out more shades in this gorgeous formula. The new Hyaluronic Summer, is also now available, a bronzer of sorts in this foam texture. Mmmmmm, need this too?! What is your favourite blush- powder, liquid or cream? Beautiful color and I love that the shimmer is so delicate! Think this would bring out my redness too much though and be a bit too much. So happy you love it!! The peach has apparently no sparkle- could be a good alternative>I have to apply on good days when redness is all cleverly covered!